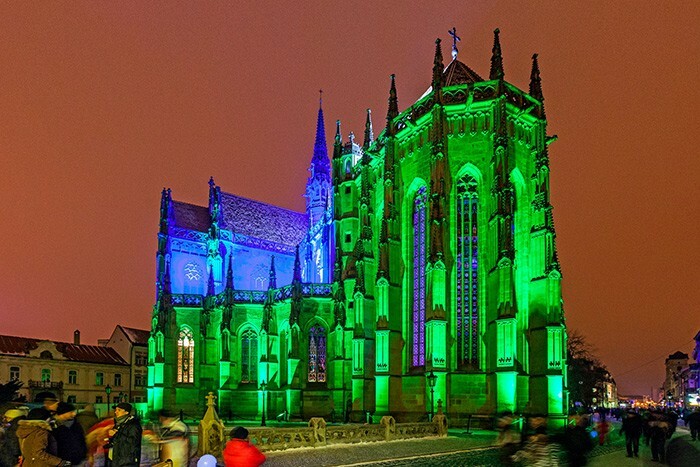 The magnificent Gothic Cathedral of St Elizabeth in Košice, Slovak Republic, became the glowing centrepiece of the city’s Opening Ceremony celebrations for its year as European Capital of Culture in a spectacular lighting scheme featuring Robe and Anolis LED fixtures. The overall OC event lasted two days with over 1000 artists performing in 70 different locations in and around the city. The Cathedral, the largest in Slovakia, was lit for the entire time, providing a jaw-dropping backdrop for the finale of the OC. 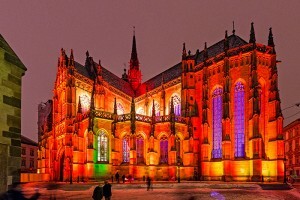 The idea of illuminating elements of the Cathedral first came from Branislav Bernár from Showmedia, the company commissioned to produce the OC. They in turn approached Anolis’s Czech based brand manager, Petr Kolmačka to assist in developing the concept. Kolmačka took these initial ideas and augmented them with plans to highlight the whole Cathedral exterior in a ‘monumental’ energy efficient LED scheme. “I knew this was an opportunity to illuminate a unique building and illustrate exactly what can be achieved by using modern LED technology on beautiful historic architecture,” he comments. The plans were approved by Branislav Bernár, Showtime’s Creative Director Lumĭr Mati, and Petr Kolmačka created the lighting scheme using 18 City Scape Xtreme Wireless fixtures with nine degree lenses, six Anolis ArcPad Xtremes with a mixture of nine and 22 degree lenses, 18 Robe CitySource 96 Integrals, six Robe CitySkape 48s, 32 lengths of Anolis ArcLine Outdoor Optic 80 MC/SW 27° and eight Anolis ArcPower 384 rack-mount of Robe RUNIT WTX wireless data. Half the fixtures were run via Lumen Radio wireless DMX to reducing cabling and the time needed for setup. The church, with its origins dating back to 1230, is over 200 square metres in size and can accommodate 5000 people. It is located right in the heart of the City’s main street, dominating the vista. Its larger surfaces were lit with the ArcPad Xtremes, while the individual columns and detailed High Gothic features were picked out using the CitySkape 96s. The areas between the columns were highlighted with the ArcLine 80 MC/SWs, and the roof was also shaded with the same ArcLine fixtures because in addition to offering smooth RGBW colour mixing, there are also an excellent range of proper whites ranging in colour temperature from 2700 – 8000K. The lights were all programmed and run using a grandMA2 light console. Time was a big challenge with only three weeks between the scheme being fully confirmed and needing to be realised, so Kolmačka energised the services of two companies, Q-99 from Bratislava, Slovakia and AV Media from Prague in the Czech Republic in a cross rental agreement to provide the kit. The weather was a real challenge for the actual installation, with technicians and riggers contending with the extremities of snow, driving rain and strong winds plus an icy church roof which presented further hazards during this period. 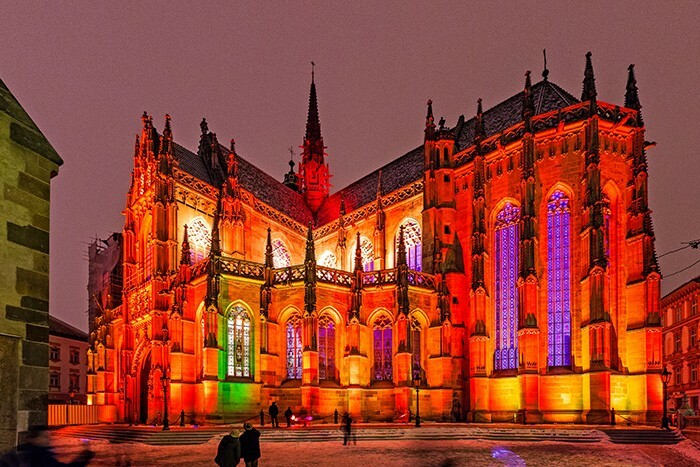 The OC was broadcast live by national broadcaster RTVS and the Cathedral lighting was enjoyed by approximately 60,000 people who flocked into Košice over the weekend event, including the Slovakian President, Ivan Gašparovič, and a host of other politicians, dignitaries and VIPs. 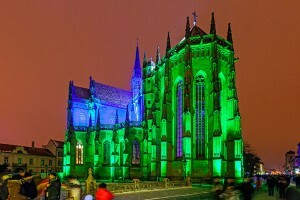 For Kolmačka it was a personal dream to light the Cathedral. He has a shortlist of potential fabulous buildings that he would like to light with Anolis fixtures! He never doubted how eye-catching the results would be, however the positive reaction to the lighting scheme was on a completely unpredicted scale – both from the public and the institutions and organisations involved! The City Council was receiving around 300 calls a day after the end of the OC event asking why St Elizabeth’s was no longer lit – a response so overwhelming that discussions have started about a potential permanent lighting installation for the Cathedral.